Back when I was learning how to drive, my dad used to say, "You drive the car. Don't let the car drive you." He said it whenever I was going too fast and starting to lose control. I thought about that expression a lot last week. It was one of those stomach-virus, up-all-night-with-vomiting-children kind of weeks. Toss home-renovation chaos and thirty-two weeks of pregnancy into the mix, and I was left with a simple choice—either escape to Starbucks the moment my husband got home or risk internal combustion. "In other words," I explained to Clint one afternoon, "this cup of coffee—and more importantly the silence surrounding it—is a matter of life or death." He let me go. 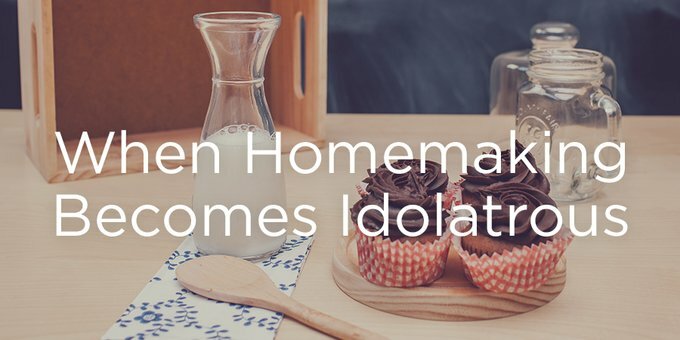 It's so ironic that something as worthy as the calling to manage a home can become one of the greatest sources of idolatry and sin in my life. The moment the scent of macchiatos wafted through the air, my mind started to clear. I thought about all that I was "escaping"—five loads of post-vomit laundry waiting to be folded (for the past three days now), endless bickering over an Elsa doll I would've paid a thousand dollars to multiply into two, enough toys on the living room floor to start my own business, enough crumbs on the carpet to feed a village of mice . . .
My Home, My . . . Idol? "You manage the home. Don't let the home manage you." Hmmm . . . Suddenly, I was fifteen years old again, trying to drive a car that was completely out of control. It's so ironic that something as worthy as the calling to manage a home can become one of the greatest sources of idolatry and sin in my life. It's been this way for me for a long time now. I'm the kind of person who would rather clean my whole house and then race to pick up the kids from school looking like I just escaped from a refugee camp rather than risk returning to a home that looks like a refugee camp. It's just my thing—the idol I am always drawn to. And you want to know the truth? It really has nothing to do with the house at all. When everything is clean and orderly around me, I feel like my heart is clean and orderly. I feel like I'm in control. Like I'm successful. And that is what drives me. It's that God-like feeling (delusion, really) that I can manage the messes in my heart by managing the messes in my home. But as all neat-freaks know, it's as fleeting as a clean countertop. And here's the really ironic part: All the time I'm parading around like a goddess in control of her universe, the house is actually controlling me. It's governing my emotions and reactions. Dictating my choices and attitudes. It's not my minion; it's my master. Why else would I feel the need to escape? Desire to bless my family with a beautiful home? Fantastic, we'll keep that. Egotistical drive to feel good about myself? Yuck, into the garbage. Longing to serve others? To enjoy and embrace my calling as a homemaker? Awesome, we'll keep those, too. Competitive, materialistic spirit, consumed with earthly things? Trash! But the bad motivations in my heart aren't like the onions I can just pluck out of my toddler's dinner. They're woven in deeply, like a virus. What I need is the antidote. I need the true answer for the aches and desires of my heart. I need to remember that this longing to "nest" is really a longing for security and stability. It is my heart's cry for a place of belonging. And into this deep heartache, Jesus offers security, identity, and purpose. He looks at me (and you) and says, "You are a chosen people, a royal priesthood, a holy nation, a people belonging to God, that you may declare the praises of him who called you out of darkness into his wonderful light" (1 Peter 2:9). He looks at me (and you) scrubbing vomit out of the carpet at 2 a.m., and He says, "My grace is sufficient for you, for my power is made perfect in weakness" (2 Cor. 12:9). He looks at me (and you) racing through dishes and diapers, carpools and catalogues, trying our very best to just be good enough, and He says, "You have been crucified with Me, and you no longer live, but I live in you. So live this life on earth by faith in Me, because I love you and I gave myself up for you" (Gal 2:20, paraphrased). I need to remember that this longing to "nest" is really a longing for security and stability. It is my heart's cry for a place of belonging. Security, identity, purpose. Hope, strength, grace. How foolish to believe we could find these things in a can of paint or an organized playroom! Does this mean we toss in the towel and sign up for a guest appearance on Hoarders: Buried Alive? No . . . tempting as that may sound. You and I have been called to a race (Heb. 12:1). It started the moment we surrendered to Christ, and it will culminate the day we cross the finish line and land in His arms. We must keep running, but just as importantly, we must ask ourselves why we are running. Are we running to be accepted, or are we running because we already are accepted? Are we running for the heavenly prize or an earthly one? Oh, how tragic it would be to cross the finish line with a "perfect" home and a lifetime of aimless running (1 Cor. 9:24-27)!